The indicator plots charts of profit taken at the Close of candles for closed (or partially closed) long and short positions individually. The indicator allows filtering positions by the current symbol and specified expert ID (magic number), to set the start time and the periodicity of profit reset (daily, weekly or monthly) to calculate the profit chart. The indicator also displays the floating (not fixed) profit of the positions opened after its was launched, according to the filter settings at the candle closure. This is a demo version of the Trade history indicator. 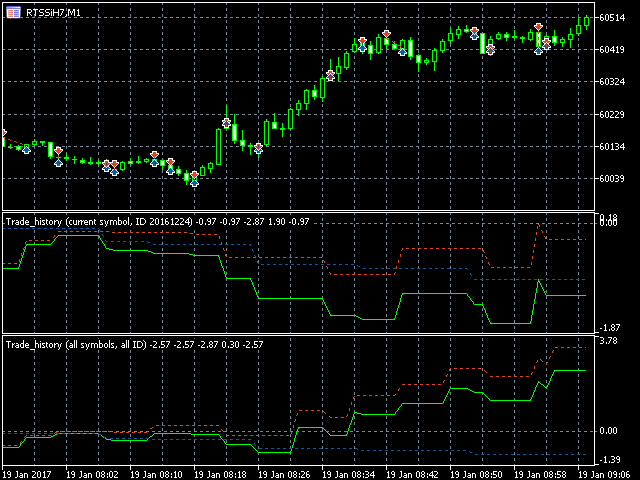 It works only on the M1 and D1 timeframes and with the instruments that contain "EURUSD" or "Si" in their names. The full version of the instrument works with any timeframes and instruments (including stocks). 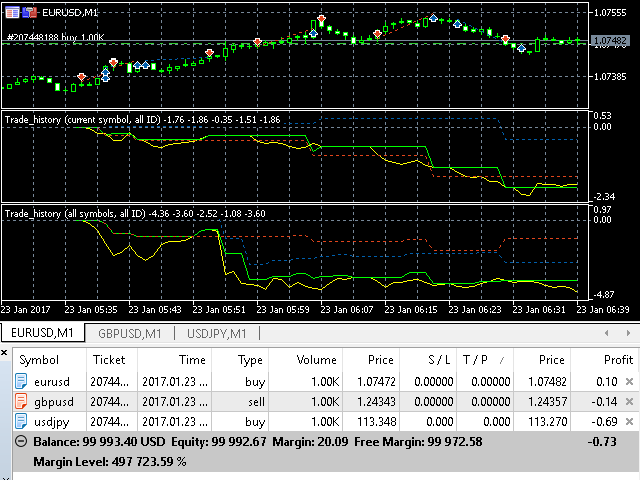 The indicator can be useful for analysis of efficiency of multiple experts trading on different symbols and directions on one account from a certain point of time. The available history of deals fixing a profit is used to plot charts of the fixed profit. The profit values of deals are used excluding commissions, i.e. 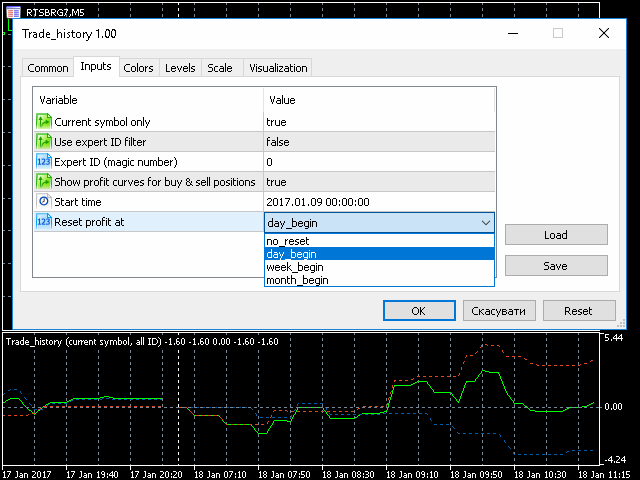 the indicator uses the values listed in the "Profit" column of the "History" tab in the "Toolbox" window of the MetaTrader 5 terminal. Current symbol only - boolean parameter (true/false), indicating the need for filtering deals by the current symbol. Use expert ID filter - boolean parameter (true/false), indicating the need for filtering deals by expert advisor ID (magic number). Expert ID (magic number) - expert advisor ID (integer) which is used in filtering deals by expert ID (for manual trading expert ID equals 0). This parameter is not used when the Use expert ID filter option is set to false. Show profit curves for buy & sell positions - boolean parameter (true/false), indicating the need to display separate charts of fixed profit for long and short positions. Start time - date & time parameter, specifying the initial time moment for calculating charts of fixed profit. Reset profit at - parameter of enumeration type with the values no_reset, day_begin, week_begin, month_begin. It indicates the need for daily, weekly or monthly reset of profits. Floating profit - line (solid yellow by default) showing floating (not fixed) profit of positions opened according to the filter settings at the candle closure since the indicator was launched. 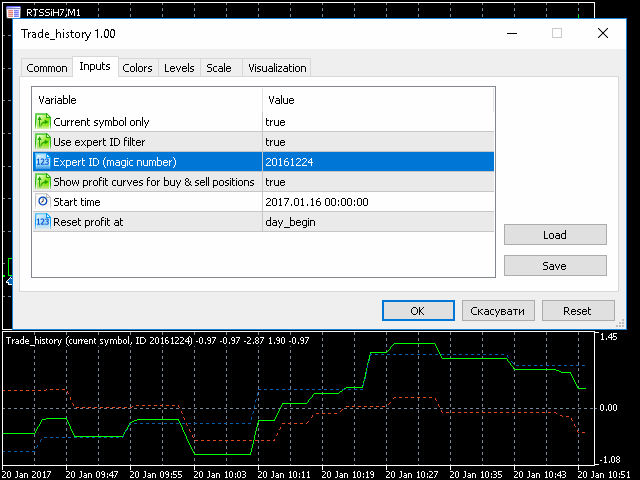 Fixed profit - line (solid lime by default) showing fixed profit at the candle closure for closed (or partially closed) long and short positions according to the filter settings. Fixed profit (buy) - line (dotted blue by default) showing fixed profit at the candle closure for closed (or partially closed) long positions according to the filter settings. This line is not visible when the Show profit curves for buy & sell positions option is set to false. Fixed profit (sell) - line (dot red by default) showing fixed profit at the candle closure for closed (or partially closed) short positions according to the filter settings. This line is not visible when the Show profit curves for buy & sell positions option is set to false. Invisible service buffer - hidden auxiliary buffer which should be ignored.